ADI applauds New Jersey, as it takes the lead to become the first US state to ban the use of exotic animals in circuses, thanks to bill sponsors NJ Senator Ray Lesniak and NJ Assemblyman Raj Mukherji. Nosey’s Law passed the NJ Senate last year as S2508, sponsored by Senator Lesniak, to ban circus elephant acts, and was amended by Assembly (A4386) sponsor Asm. Raj Mukherji to ban the use of all exotic animals in traveling circuses. Nosey’s Law is named after long suffering circus elephant Nosey, who was recently placed into a sanctuary, temporarily confiscated after decades on the road. The bill was originally scheduled for a vote last week, but was postponed after adverse weather conditions closed all state offices. Nosey’s Law passed the NJ Assembly [66-2] and the Senate [31-0], with overwhelming support for landmark bill; A4386/S2508 could go to the governor’s desk as early as tomorrow. In the United States, audiences have been turning away from animal circuses in droves; several, including Ringling Brothers Barnum & Bailey Circus, have closed, while others have gone animal-free and thrived. Last year, New York City followed San Francisco’s ban on wild animal circus acts; Los Angeles is working on a ban as well. 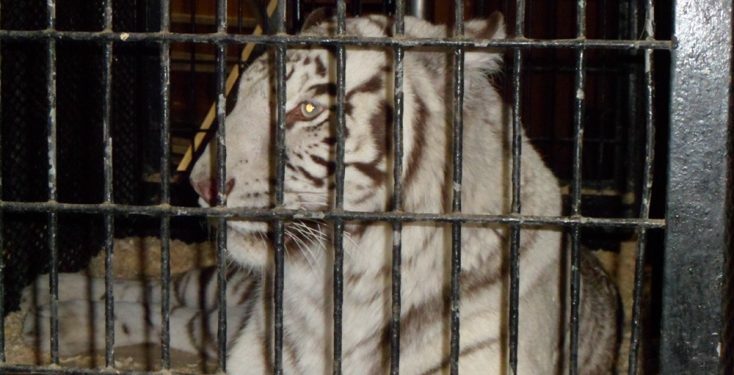 88 US jurisdictions in 31 states have now taken action to restrict wild animal circus acts. A number of other states, including Pennsylvania, Massachusetts, Hawaii, and New York, are currently considering bans on wild animals in circuses, and a federal bill – the Traveling Exotic Animal and Public Safety Protection Act (TEAPSPA /H.R.1759) – is gaining bipartisan support in the US House, to end the use of wild and exotic animals in traveling shows nationwide. Around the world, 45 countries have passed national circus prohibitions, with Italy, Ireland, and Scotland most recently joining the list. Support TEAPSPA, the nationwide ban for the US! Outside of the US, join our global campaign to Stop Circus Suffering! Follow us on Facebook and Twitter for more ways to get involved in our campaigns.